The waiting (for the package from Hong Kong) is the hardest part but it has given me the chance to get some little stuff done and replace the capacitors in a friends Arp Omni (more later). 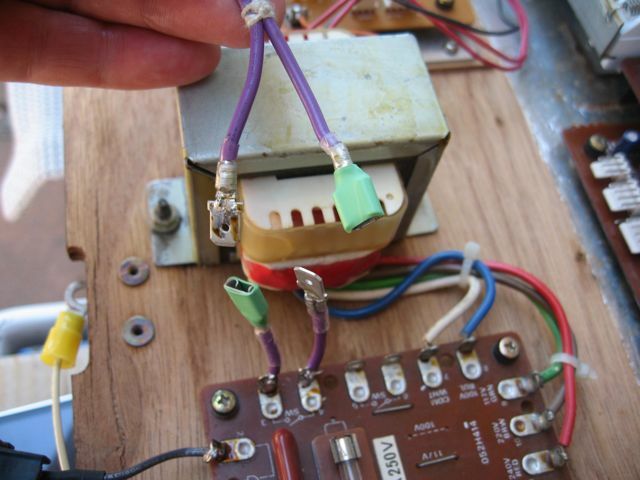 One of the things that has bothered me about the Juno 60 is the connections to the panel in the power supply that have to be cut or de-soldered to remove the panel -yesterday I added an EIC socket that unscrews from the inside so it can be removed from the panel and today I added spade connectors to the wire that runs to and from the power switch so it can be pulled out of the top. Pretty colors! The Arp Omni has spade connectors to the power supply from the switch so it should be okay right? I added a few layers of heat shrink to the connectors to protect against problems. Note the little string knot holding the two purple wires together -it was someones job to tie little knots all day long -can anyone say RSI? Lots of little details to wrap up and then I can start enjoying this synth for what it can do -I suppose the last installment will be a song composed for and entirely played on the Juno 60. I’m waiting on a package from Hong Kong based Technology Transplants that will be the new toggles I need along with a slider cap set and some other stuff I can’t remember. In the mean time I’m moving slower than normal but it has given me a chance to do some little jobs like install an IEC type plug. I love the convenience of having the same cord power all your stuff. 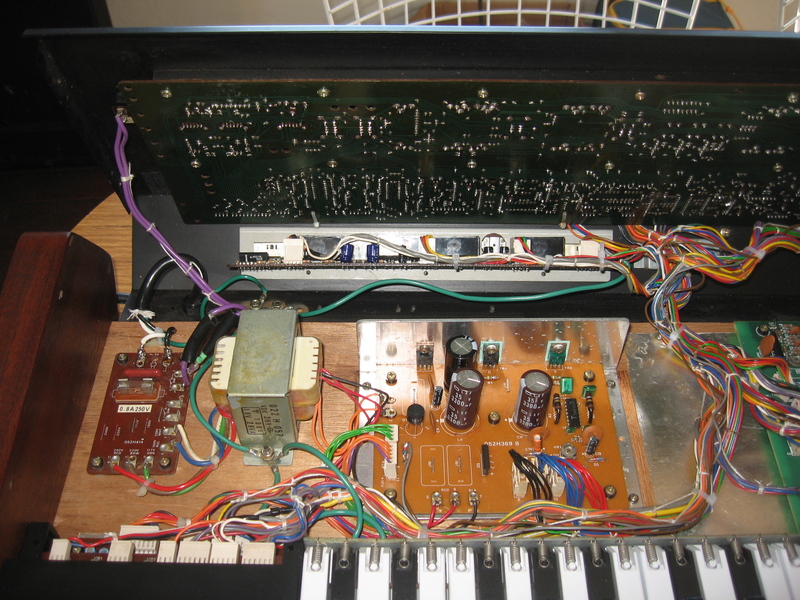 This was pillaged from my parts Prophet 600. It’s a cheap part but it saved me a drive pulling it. Thursday I’ll get my drill and Dremel from my dads house (long story) and modify the panel. Any long task is accomplished in small increments. A difficult task is accomplished by spending more time thinking about it than trying to do it. A long difficult task… you get the idea. The bender panel on this Juno 60 is frankly fucked up. Let’s give it a clean. Gold finger would love it. 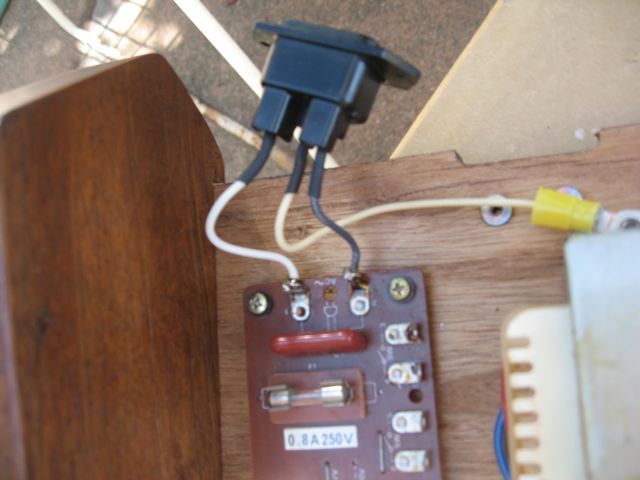 Amazing thing is there were no screws securing the board or bender to the panel, it rattled around, but it worked. 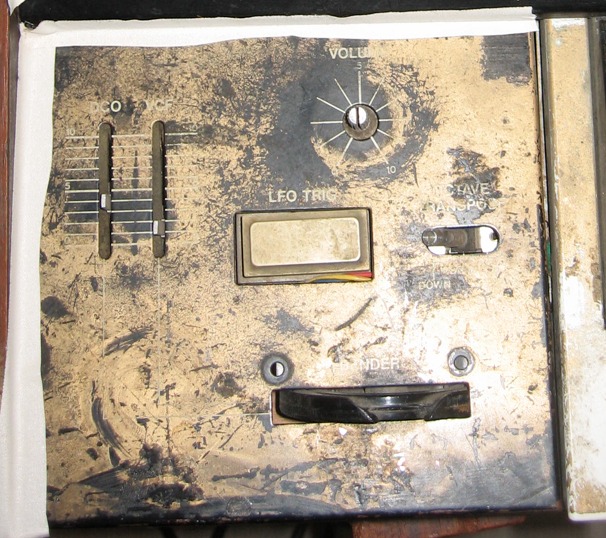 Synthesizers of this era relied on mechanical components to select and vary controls. Toggles to switch between settings or switch them off, sliders and pots to vary resistance and incrementally change the magnitude of a filters effect/strength of amplification/rate of change etc and momentary switches to change logic states. This afternoon I removed and cleaned up all the momentary switches that control the wave forms, chorus settings, presets and write capabilities. If this thing was a little cleaner I would have cleaned them on the boards, but as can be seen below, the boards are pretty dirty and removing them was only a few minutes work. 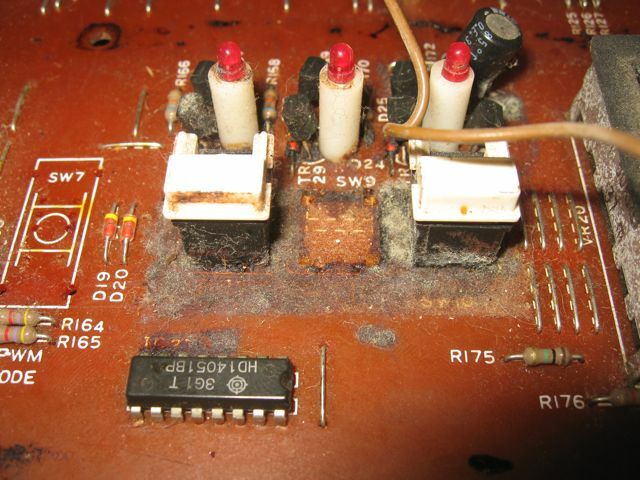 Pretty gross build-up on these switches and on the circuit board below them. I pulled the middle switch the other day to see why it didn’t work -it was missing the little contact button. There’s one of those Hitachi HD14051BP’s that are probably about to hit the endangered IC species list. 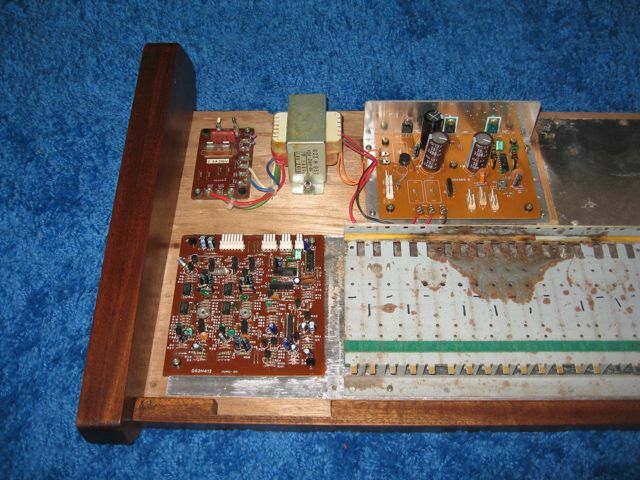 The Juno 60 is possibly the last synthesizer in the Roland line to feature wood ends. 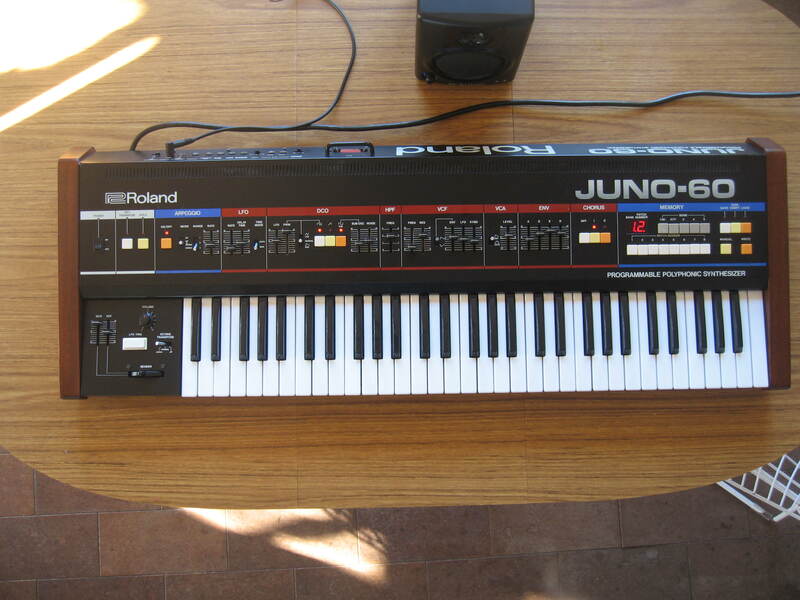 Jupiters’ 6 & 8 had brushed metal ends, the SH’s and RS’s by this time were electronic sandwiches with plastic for bread and the Juno 106 had plastic as well. To say the Juno 60 has wood ends is somewhat of a stretch really, as it’s really wood simulating sticker applied to particle board. Starting at the end for once. Here you are -a pair of cheeks and front edging in Sepele -an African hardwood a lot like Mahogany but about $6/BF, with a walnut stain and satin urethane finish.